The Type 60 ATM is a Rank V Japanese tank destroyers with a battle rating of 7.0 (AB/RB/SB). It was introduced in Update 1.67 "Assault". Suspension wheels and tracks are both 15 mm thick, while torsion bar chassis is 12 mm thick. 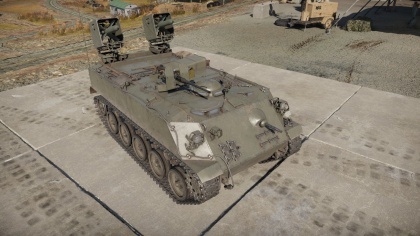 The Type 60 ATM comes equipped with a coaxial 12.7mm M2HB Browning machine gun and a smaller 7.62mm Browning machine gun. The 7.62mm is virtually useless, and can sometimes come in handy for clearing some debris. The 12.7mm machine gun helps to deter any enemy aircraft due to the weak armour on the top of the vehicle. The Type 60 ATM struggles in close quarters and is completely unsuited for urban battlefields. 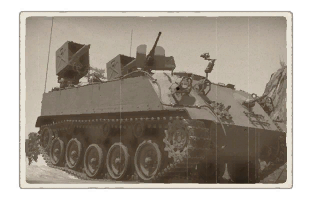 When playing the Type 60 ATGM consider all your flanking routes as your high damage potential can be most effectively harnessed in these environments. Avoid all major sight-lines, and pick your targets carefully. The cover is your best friend, finding positions, where you can scout enemy vehicles for your team, can often be more beneficial than attempting to kill enemy tanks. The Type 60 ATM often plays out as a support vehicle instead of a tank destroyer. The Type 60 ATM's biggest threats in battle are many. Avoid all vehicles at all costs to prevent dying; almost every shell at your BR will kill you with ease. The vehicle will often face front when you fire where 3 of your crew are crammed together, 2 of which are the gunner and driver. This page was last edited on 26 March 2019, at 06:34.